While Unbranded is visually stunning in terms of capturing the beauty of America’s public lands, it is riddled with the ugliness of the animal abuse wild horses can suffer when they are ripped from the range and placed under human ownership. The message viewers are left with is that wild horses exist to be exploited by people who will use them for their own gain. We couldn’t disagree more. Unbranded, a feature-length film released in 2015 and categorized as a documentary, will leave true wild horse advocates feeling like it should be filed in the horror film category. That’s because the film is partly sponsored by Mustang Heritage Foundation, a Bureau of Land Management partner. The film is pure BLM propaganda. Unbranded documents the reckless 3,000-mile ride four friends took, on the backs of wild horses, through dangerous, punishing terrain throughout Western public lands. It’s the macho John Wayne fantasy of these young men brought to life ostensibly to “prove” the worth of wild horses up for adoption by the BLM. Peppered throughout the film are interviews with BLM employees, ranchers and even a representative from a so-called wild horse advocacy group, American Wild Horse Preservation Campaign, who perpetuate the lie that there are “too many wild horses” on public lands, and portray roundups and contraception as necessary, all the while denying that horses are a reintroduced native species. Cattle and sheep are absurdly portrayed in a sympathetic light while wild horses are demonized for destructive “24/7” grazing on rangelands. These fame-seeking egotistical “cowboys” force the mustangs through hell and back, with no regard for the safety of the horses they treat as disposable machines— all to make for a more dramatic, compelling film and to portray themselves as rugged “heroes.” And all this while erroneously portraying themselves with altruistic motives in promoting the BLM’s wild horse adoption program by proving that wild horses can be tougher than domestic horses. The film begins with the wild horses being sadistically “broken” to become quasi-domesticated—a violent, abusive process they fight by wildly bucking off heavy saddles, ropes and riders. One of the riders foolishly declares during the breaking process, “It’s bad because they have a really deep-rooted wild streak,” seeming to despise the fact that these aren’t domesticated horses ready to take orders. Immediately into the actual ride, the wild horses are purposely led into harm’s way by ringleader and map-quester Ben Masters, who steers them through 60 miles of Arizona desert he knew was littered with a variety of unavoidable barbed spine cactuses that attach them-selves all over some of the wild horses’ bodies. Viewers are told it took the riders four days to rip out all the long spines, as the horses were bucking and terrified. This is animal abuse engineered to start the trip off with a dramatic effect. 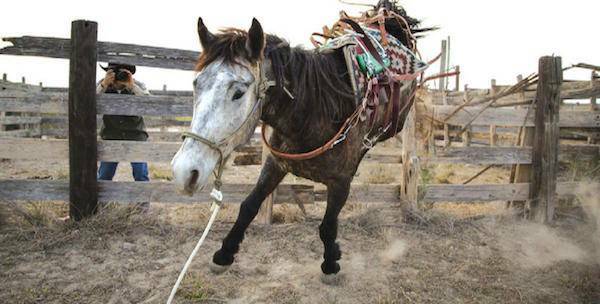 Weeks after riding 20 miles a day, wild horses Violet and Tamale are discovered to have serious leg injuries. Both are taken away by trailers and replaced by new wild horses—Tamale’s rider callously declaring “he’s out,” as if the animals were defective cars. A wild horse named Cricket suddenly dies on day 98 of the ride and his corpse is shown lying under a tree. A broken neck and severed esophagus is given as cause of death, but how did such grievous injuries occur? His tail is cut off by a rider and taken. The men hardly seemed concerned. They claim to not know how Cricket died, and they romanticize Cricket’s death as being better then dying in a stall or holding facility. Friends of Animals is included in the film—clips of our rally and press conference outside the 2014 BLM Advi-sory Board Meeting in Riverton, WY, are shown, and our efforts to get North American wild horses protected under the Endangered Species Act highlighted, yet portrayed as extreme. The idea that wild horses are being managed to extinction only gets airtime as a fanatical opinion that doesn’t jibe with the BLM propaganda. While Unbranded is visually stunning in terms of capturing the beauty of America’s public lands, it is riddled with the ugliness of the animal abuse wild horses can suffer when they are ripped from the range and placed under human ownership. The message viewers are left with is that wild horses exist to be exploited by people who will use them for their own gain. We couldn’t disagree more. We will continue to fight to ensure America’s wild horse remain truly unbranded— wild and free on public lands where they belong. This means urging more people to be vegan and to put cattle and sheep ranchers who degrade public lands and exterminate wildlife out of business.